The word “nativity” means the process or circumstances surrounding a birth but has become synonymous with the birth of Christ. God always had a plan or process to communicate His love by sending His Son to earth, but that plan was His alone with His timing for it. 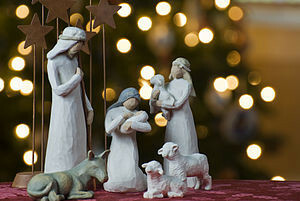 Galatians 4:4 says, “…when the fullness of the time had come, God sent forth His Son, born of a woman…” There was a day when the world did not see Jesus, but in the fullness of time there was a Nativity. Jesus was born, and now we see Him! He was made “a little lower than the angels” meaning that Jesus was human. We could relate to Him. He was not born into worldly riches or political status. For how could we relate to such a Savior out of touch with the populous as many leaders are today? He was human. He was hungry at times and tired at others. He was tempted as we are, yet without sin. He knows our trials and struggles and rejection. Yes, this Savior is relatable! Jesus came for a reason and that was to suffer and die for the sins of the world. He came according to God’s plan. He endured the cross and the shame associated with it because of the joy set before Him that His creation could be saved, that sinners could be forgiven. This is good news especially in light of His victory over death. Truly, He was crowed with glory and honor from God as He carried out God’s plan of salvation. Because Jesus tasted death by the grace of God, the repentant sinner does not taste it. The sinner who deserves judgment now receives grace. That is a gift. That is glorious.